I woke up 9am to finish off Junior's nursery and I had severe pain in my pelvis, I had put this down to my SPD and walking round Ikea on Friday for the wardrobes. I started the day by cleaning the skirting boards and hoovering the nursery. Nice easy day sat on the floor giving my partner instructions on how to build all the furniture. I started getting twinges by lunch time and thought they were just BH's as I'd over done it all weekend. 4pm we had gone to the in-laws for our Sunday lunch and to pick the cot up and clean it. The pains were a little stronger but nothing to make me think I was in labour. About 6pm they were becoming a bit more noticeable, my partner by this point made me phone the mw, she suggested a nice hot bath and a couple of paracetamol and to phone back at 8:30pm if no better or they're getting worse. By 8:30 they had got quite painful so rang the mw back and was told they are more than likely BH's but to go to RSH for monitoring and I'll be kept in over night. The consultant finally decided to examine me (with those plastic things they use for a smear??) whilst I was having a contraction and no pain relief I seriously wanted to kick him as it was so painful and uncomfortable, he then pulls out and decides to examine me AGAIN and I was 5-6cms, so they give me my first steroid injection and told me I'll be there for the next. They scanned to see which way baby is facing and he was fully engaged! No wonder I had severe pain in my pelvis. 10:45pm we were wheeled down to a delivery room and I asked for pethedine as the G&A wasn't doing anything. Our stay in neo natal was for 7 weeks exactly, and what a long journey that was. 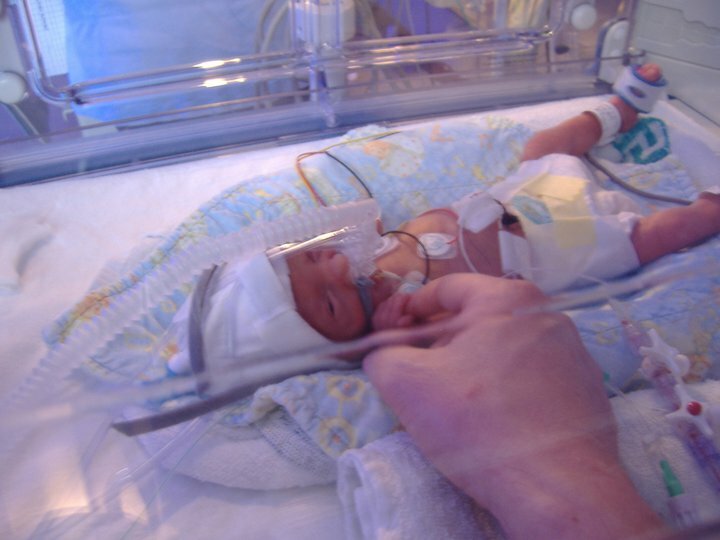 Charlie was resuscitated at birth, then ventilated for 24hours. He was on CPAP until 2days old, in air for a few days then back on O2 prongs, he had to have a topup transfusion at 3 weeks old due to constant jaundice and meningitis, he was back on CPAP at 3 weeks old due to Meningitis for 2 days, then back in air for 3 days and then back on O2 prongs between 20cc and a leak. He was finally taken off O2 at 35 weeks. 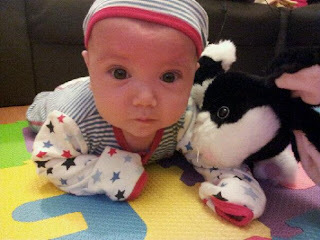 Charlie came home exactly 7 weeks old, but when he was 16 weeks old he had an apnoea and was blue lighted to hospital. His O2 levels dropped to 72 which was unbelievably the scariest thing to happen to us outside of the hospital. He had to have his 5th lumbar puncture to make sure it wasn’t meningitis again. But it was a UTI, we were in hospital for 4 days and got sent home on oral antibiotics, but we had a phone call a day later to say that the hospital hadn’t chased his blood results and it turned out the UTI had spread to his blood too. So we had to go in daily for IV antibiotics. We’re having a number of tests done because of this UTI and his has to stay on his antibiotics until they’re all complete. Which will be when he’s 1. Charlie also suffers from reflux, but he is only on Gaviscon for this, and not as bad as when he was born. He is 6 and a half months old now (4 months corrected) and we are just started to look at BLW (Baby Lead Weaning), we’ve chosen this route because if we go with purees we need to give him his gaviscon for his reflux, but with BLW the food is lumpier so will be easier to settle in the stomach because the smoother the food the easier it will come up. So we know when we introduce things like soup or yogurt it will come back up. We’ve not had any rolling yet, but he can go from his back to his side and he is constantly doing this, so it won’t be long before he’s there. He can sit unaided for a few seconds, I know it may seem long for some, but it’s a milestone for us. He is such a happy baby and weighed a whopping 14lb 4oz and 5 and a half months old. Charlie was breast fed until he was 11 weeks old when he chose he no longer wanted the breast, it was the hardest decision we ever made, but we had to put him on formula. He had the best start he could, and he is thriving on formula. Charlies story is so similar to my little Oliver's experience he was born at 31 weeks weighing 3lb's 5oz via c-section due to pre-eclampsia, he was ventilated, and on CAP for a few days, and had to have a chest drain around 2 days old. At 3 months old he caught meningitus and had a UTI and was on anti-biotics for 10 days, at 4 months he was back in the hospital having another lumber puncture luckily it was not meningitus again only another UTI again nurses came out twice a day to administer anti-biotics via IV. Now he is just over 6 months old and weighs 15lb's 11oz and is perfect, He remains on anti-biotics due to UTI as he has a wee reflux. I am currently introducing him to solids.